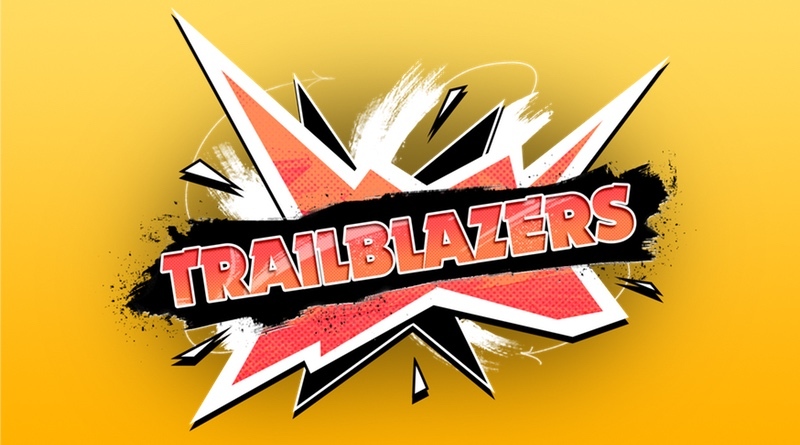 They say that imitation is the sincerest form of flattery, and that’s entirely the case with Trailblazers. Part F-Zero and part Splatoon, the developers have created a futuristic racer and infused it with the power to lay down paint on the tracks to create boost streaks. In theory this sounds like a pretty awesome racing game and the concept is quite compelling. I’ve been itching to play this one since it was first announced for Switch early in the year, but unfortunately sluggish controls mar what should be a great game. Painting roads isn’t exactly a new idea – NES gamers were doing so 30 years ago with City Connection. However, Trailblazers does take the gameplay mechanic in a new direction. Typically games like F-Zero and Wipeout place boost pads on the racetrack so players can strategize and hone their racing skills to blast past the competition. Here there are no preplanned boosts. Instead the hovercrafts come equipped with paint that can be sprayed down on the track. When you race over the same colored paint you’ll begin to boost. The longer you stay in the zone the faster your vehicle will go. In team races you and your fellow members will lay down paint in early laps so that by the final lap you can focus on hitting those strips of paint and propel yourself into first place. Of course your opponents will be laying down their own colored strips of paint that will slow you down. Just like in Splatoon, you’ll soon discover that it’s sometimes best to overwrite their paint with you own. Not only are you creating boost strips for yourself, but also taking away boost strips from your competition. Placed around the tracks are small portals that you can drive through. If you’re successful you’ll claim that portal and a bunch of paint will spray forward in a line creating a nice bonus boost strip that doesn’t require you to use up any of your precious paint. The meter at the top of your screen displays how much paint you currently have in reserve. This will refill after a short time, so you can continue laying down as much paint as you can as long as you still have laps to drive. The downside to spraying paint is that you can’t boost at the same time. You can strategize all you like, but I found it was usually the most helpful to lay down boost strips in the first couple of laps of a race and then concentrate on driving over those strips and boosting to rocket back into the lead. If you have a completely full gauge of paint you can also attack a driver directly ahead of you by pressing a button and shooting out a line of paint. If it makes contact with their vehicle they will spin out. All of this would be great if the game controlled better. One of the key components to a great racing game is having impeccable steering, braking, drifting, and sliding. While not the worst I’ve ever encountered, Trailblazers leaves much to be desired in the control department. When you first begin a new game and are in the training modes and the lower tier circuits the game’s controls are average. I don’t know about you, but when I’m playing a racing title I like to feel in total control and have fun. I also like for there to be a sense of speed so that the adrenaline kicks in and I forget to blink for minutes on end. None of that is here and it’s because the vehicles are clunky and simply don’t have great handling. Anyone who has played Mario Kart 8 Deluxe will know that once you get the jumping and sliding down that you can really zoom around the tracks with ease and everything just feels right. Here there isn’t a great way to lean into a turn or to take corners gracefully. So many times I found myself simply bouncing off the sides of the track because there really wasn’t a great way to get past specific parts. This is especially true when you’ve laid down paint and start to boost. The longer you stay in the paint of your color, the faster you’ll go. Eventually I was going so fast that there was simply no option but to crash because the game fails to facilitate adequate controls over the vehicles. In a game where the objective is to put down boost strips and go as quickly as possible, it’s awfully punishing when you succeed. As for options, the game is pretty bare-boned. There aren’t a ton of modes and the ones that are there all play the same. Sure, you can go online (and there’s even cross-platform play if you like) or play locally, but there’s not much here that you can’t find elsewhere. Working together with your team to lay down paint in strategic places is kind of fun, but it wasn’t enough to hold our interest for very long. Graphically the game is pretty average. The graphics are bright and colorful and the cast of characters looks like they jumped out of a ‘80s cartoon. They’re pretty generic and I don’t think I even remember a single one’s name. The game runs pretty good in single player mode, but the graphics take a bit of a hit in multiplayer. The vehicle designs are kind of boring and the track layouts are all over the place. As for the soundtrack it is somewhat reminiscent of Jet Grind Radio on the Dreamcast. In fact, the visuals are sort of like that game and they share the painting idea, so maybe the developers were fans of that game? The characters don’t have full voice, but will make the odd grunts sometimes utter a single word to get across their feelings. The story is pretty forgettable and boring, but I can see how a younger gamer might get a kick out of it. In the end, Trailblazers is an adequate game that features a good combination of ideas that just don’t quite come together. If the controls were better and there were a few more modes of play I think this game could have been rather special. It’s worth considering if you’re looking for another racer on the Switch.